Last year I had a little aging experiment with Ridgeway Criminally Bad Elf. I was amazed at the difference in this beer in just one year of aging. Since then I started cellaring some beers. This little match-up has been four years in the making. From the first time I had this beer I was giving it to friends and family as Christmas gifts. One of those bottles was given to my son John who happened to hold onto it until now. Last year I started to cellar a few more bottles. I ended up with John’s 2006, a couple from 2008 and a few 2009’s. I have since given away all but one of the 2009’s but I know that they are still available. My intention was to add a 2010 to this tasting but I never got around to buying any. At any rate the goal here is to see the effects of aging/cellaring these great beers. 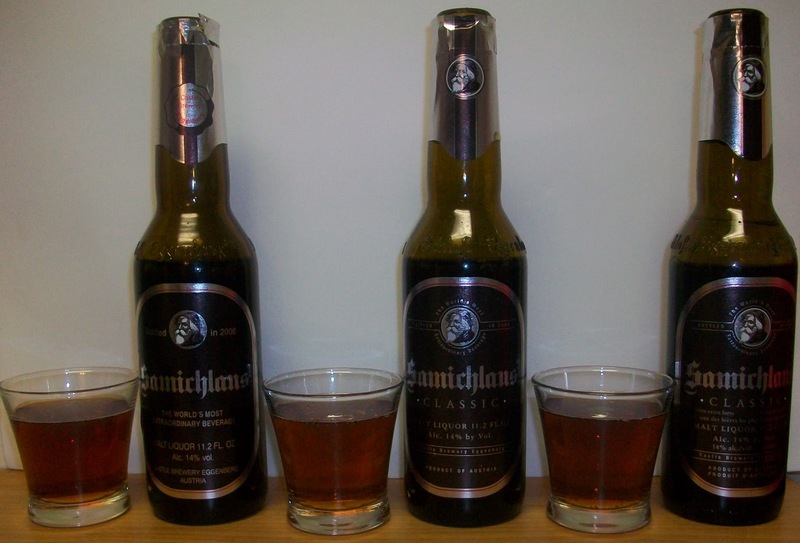 Also just for a reverence I did review the 2008 Samichlaus last year. Up front I can see that the 06 is darker and the nose is much maltier than the other two. The appearance and nose of the 08 and 09 are pretty much indistinguishable from each other. We first started tasting the 06. Oh my, want a great smooth malt flavor. There is also a tremendous warming effect as the first swallow goes down. This has noticeably improved with age. What a phenomenal brew! Next is the 08. This is very smooth but not as velvety smooth as the 06. There is a unique crispness to this one that the 06 did not have. Next we tried the 09. This is very similar to the 08 but I did not notice the crispness that the 08 had. Still this also an excellent brew. There is an amazing contrast when going back to the 06 from either the 08 or 09. The 06 vintage is just astounding now. I’m not sure how to continue with this since I’m randomly sipping from each glass. This has been a great aging/cellaring experiment. I’m can’t wait to get a 4 pack or two of the 2009 or 2010 and start cellaring them. Well, I think I’m done trying to explain the differences between each of these vintages. Now I going to start from the newest to the oldest and just enjoy each one as they go. As this warms it seems much smoother than how I remember it from last year. But then again that could all just be in my head. I’ll have to re-read last year’s review. This delectable brew just keeps getting better and better as it warms. I have purposely warmed this beer in my hand. It is now at 84.5 degrees. Wow, exquisite just doesn’t cut it. This is beyond words; well, at least my words. What an enjoyable experience. It is warming a bit but that noticeable sharpness is still there. I am going to warm this one as well. This sharpness almost seems like a bite at this temperature; at least compared to the 09. It is still extremely smooth but noticeably sharper than the 2009 was at this temperature. That was good but not as exquisite as the 09 was at this temperature. The malt difference in this vintage stayed with it until the very end. Now for the last and up to this point the best, the 2006 vintage. The nose on this 2006 is just amazing; especially compared to the other two years. The nose has wonderful nutty caramel malt aromas along with sweet alcohol notes. This is the most incredible beer experience. I can’t begin to explain how great this 2006 vintage is. I have poured the last of this one onto a snifter. We are now at 70 degrees and I’m going to take this up as high as I can naturally get it from the palm of my hand. This is incredibly smooth with rich caramel malt sweetness and a tremendous warming effect. I’m nursing this for all it’s worth. I don’t think it’s going to get any higher. OMG! This really is beyond my ability to describe. 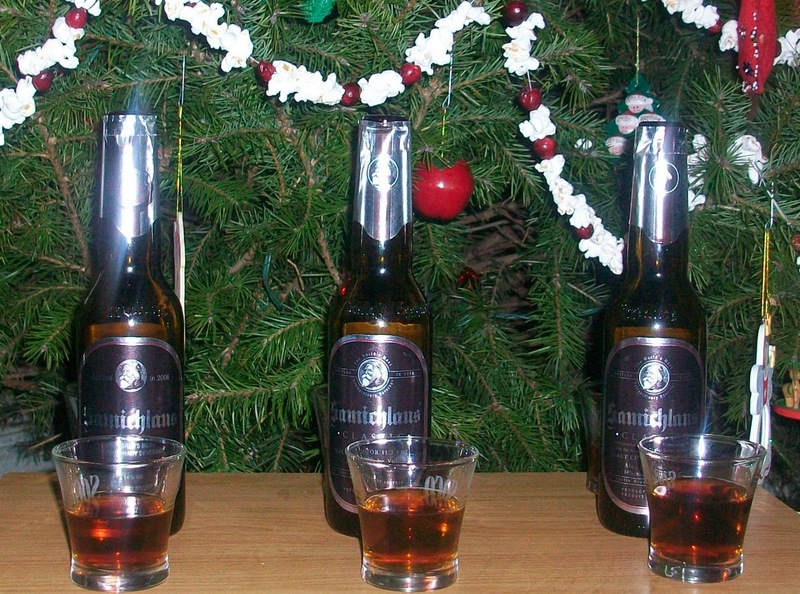 It is the most exquisite velvety smooth caramel malt goodness with a sweet alcohol finish. 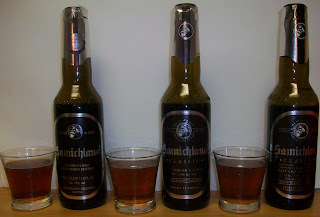 This is no longer beer; this is “Beer Liqueur”. The 2006 Samichlaus has been exquisite. This was far beyond my expectations. A phenomenal tasting beer to the last warm luscious drop. I have given several beers an A+ rating. None of those compare to this experience. So I am creating a new rating category, O for Outstanding. 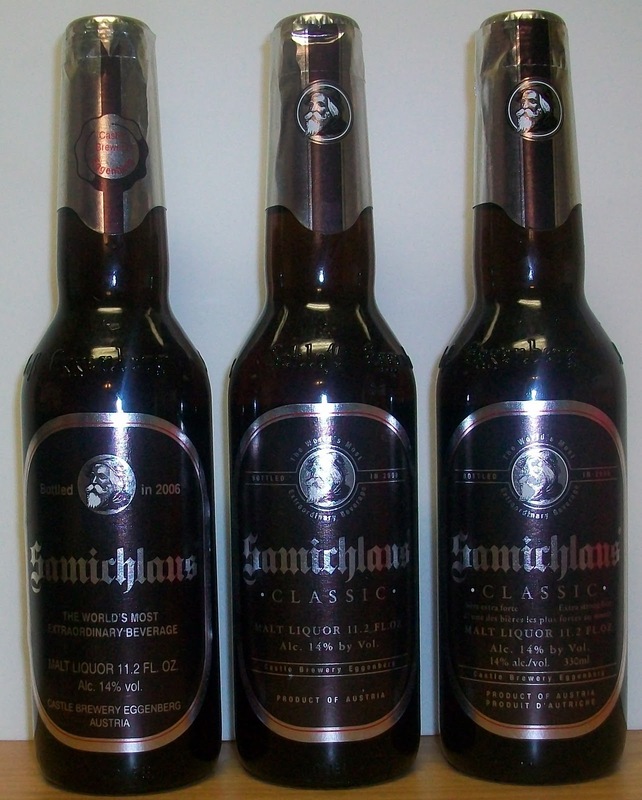 That just about sums up this 2006 Samichlaus. This cellaring/aging experiment has been a tremendous success and an unforgettable experience. I have a few other beers that I have been cellaring also. I’m really looking forward to doing more of this. How can I get a few bottles of the 2006 beer?